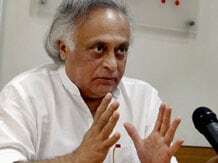 "Chindia", an idea projecting the joint rise of China and India remains a vibrant concept, but it can only be a reality if both nations can overcome suspicions and establish reciprocal partnerships, says Rural Development Minister Jairam Ramesh, who coined the phrase. "Ten years ago, when I proposed the concept of "Chindia," the whole idea was that India and China could cooperate and work together to face challenges ahead," Ramesh told Chinese state-run Global Times daily. "Beyond all doubt, there are areas where both countries are competing, but competition could be treated in a virtuous manner. It does not necessarily lead to confrontation or conflict," he said. Referring to India's concerns about China's close relations with Pakistan and New Delhi's emerging ties with Japan, Ramesh said both should over come mutual suspicions. "As of now, it seems that both India and China are worried that some certain moves of the other side are targeted at themselves," he said referring to Chinese concerns over the recent visit of Japanese Prime Minister Shinzo Abe to India. It seems that the Chinese public opinion is not fully aware of history and that Indo-Japanese relations are essentially business-driven, Ramesh said adding that "The containment theory does not stand up to scrutiny". "This is also the case when India views China, especially when China is developing a close relationship with Pakistan. But there are reasons why China and Pakistan are so close. China's good relationship with Pakistan doesn't necessarily mean it cannot develop strong ties with India,he said referring to Sino-Pak "all weather ties". "It could be asserted that the foreign policies of both nations are not set for the purpose of countering the other. India targeting China or China targeting India does not hold water. One side feeling threatened by the other is not caution but paranoia," he said. "If we see both countries in the big picture, it is China that India should value the most. Building a reciprocal partnership with China is the top priority of India's foreign policy," he said. "Only within the framework of dialogue can both sides be open to discuss all the issues that might have raised so many concerns, such as border issues," he said. "Chindia is not an outdated vision, it is actually what the governments of both countries are carrying forward. It is essential for India to understand China better, and vice versa. There is no reason that India and China should fall victim to those people who see India and China as natural rivals," Ramesh said. "People from both sides must feel comfortable with each other. Mutual trust has to be built for the good of both countries, and this requires continuous and honest investment in our relationship," he said.